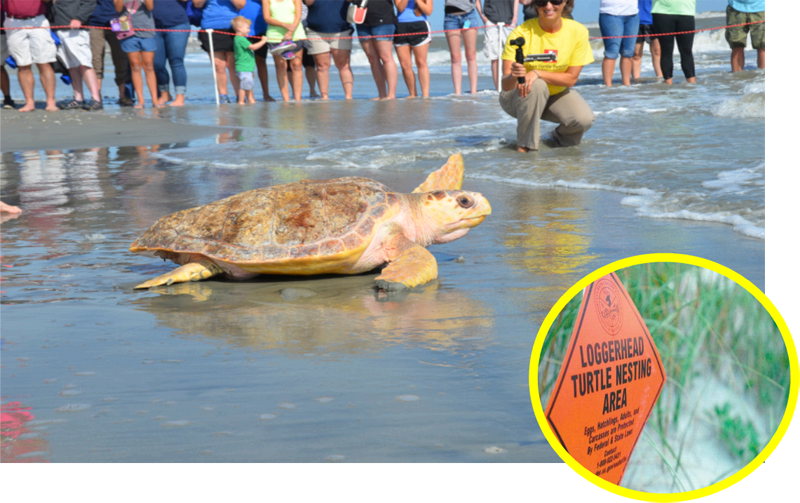 We are fortunate enough to be a prime nesting area for Loggerhead sea turtles! Loggerhead sea turtles (Caretta caretta) crawl onto the beach at Folly between May and September to lay eggs. Females nest between 2 and 5 times in one season and do not return for two to three years to repeat the nesting cycle. It is believed that they nest on the beach where they were hatched decades earlier. 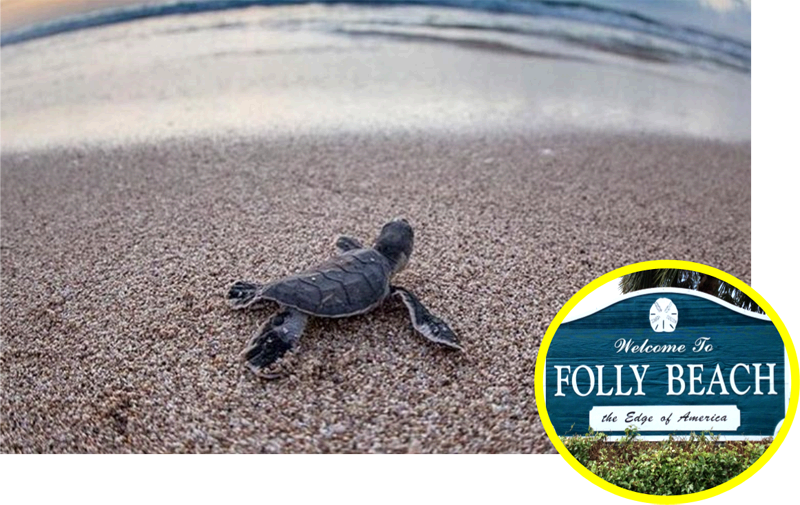 Therefore, the sustainability of nesting at Folly is dependent upon proper management of these nesting sites. Dawn is the best time for finding sea turtle tracks. The females have come ashore during the previous night, creating the distinctive “tractor” marks as they pull themselves across the sand in search of a nesting site. But don’t look for tracks near the water’s edge. Find the mark of the last high tide and look between that “guideline” and the dry sand toward the dune line (or in Folly’s case, toward the houses). If you see tracks, take care to avoid walking on the crawl or on a suspected nest site, note your landmarks (e.g., What block are you in? What’s the address or size/color of the nearest house? What walkovers are nearby? ), and call Folly Beach Public Safety at 843-588-2433. They will contact the Turtle Crew to document and assess the crawl and determine if eggs were laid. 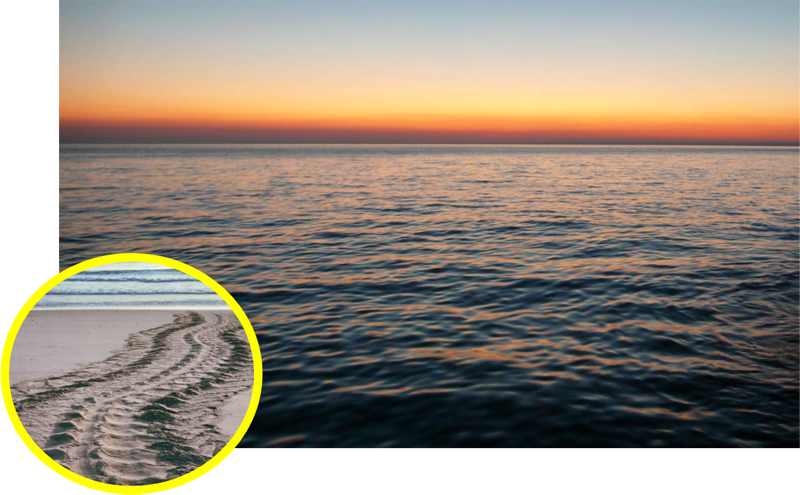 Remove all debris from the beach, especially plastics (e.g., cups, bottles, bags, fishing line). This will prevent them from being swept into the ocean by winds or high tides and mistaken as a food source by sea turtles, dolphin, and fish. Fill in holes created by “kids” at play. This will enable the tiny hatchlings to speed along their way to the ocean without getting trapped or disoriented. Watching a hatchling struggle to crawl out of a footprint increases awareness of their point of view and their obstacle-filled course. If you’re fortunate enough to see hatchlings emerge from their nest, you’ll surely be tempted to pick them up and carry them to the ocean. Stop yourself! It’s vital that the hatchlings “imprint” on their natal beach. When the female hatchlings mature, they’ll return to the same beach to nest. If you see hatchlings crawling off-course, simply guide them on a path to the ocean and cheer them on. Report any hatchling emergence or crawl activity by calling 843-588-2433. PRACTICE & PREACH "LIGHTS OUT FOR TURTLES"
Greg has managed our property for the last two years and we could not be happier. His attention to detail and hands on style is the difference. He leaves nothing to chance, from the scheduling, and cleaning, to the follow up and constant improvement of the property to get the most out of it for you the owner and for the clients. I highly recommend Folly’s Best Rentals for the property owners and for the clients.